Natalie is an experienced, dedicated and insightful advisor who has a comprehensive approach to selling or buying your home. She aims to deliver a low-stress, end to end homeownership experience for both our home sellers and buyers with proven success. She truly believes that home ownership leads to personal and financial stability which in turn translates to a community that lives and thrives together. She follows a work by referral methodology, so her greatest asset is the relationships she builds and nurtures over time. She has lived in Livermore since her childhood and has witnessed the area evolve over the years. This gives her unique and first-hand knowledge of the Tri-Valley as well as specific neighborhoods. She is committed to educating her clients while providing the best solutions to reach their real estate goals. Natalie is passionate about building community one family at a time and she has infused the same passion into her team. Natalie graduated from St. Mary’s College with a BS in business and she leads her team in all aspects from sales and operations to strategic positioning. She is committed to constantly improve the team through continued education ensuring they stay current on the developments in the industry and technology. 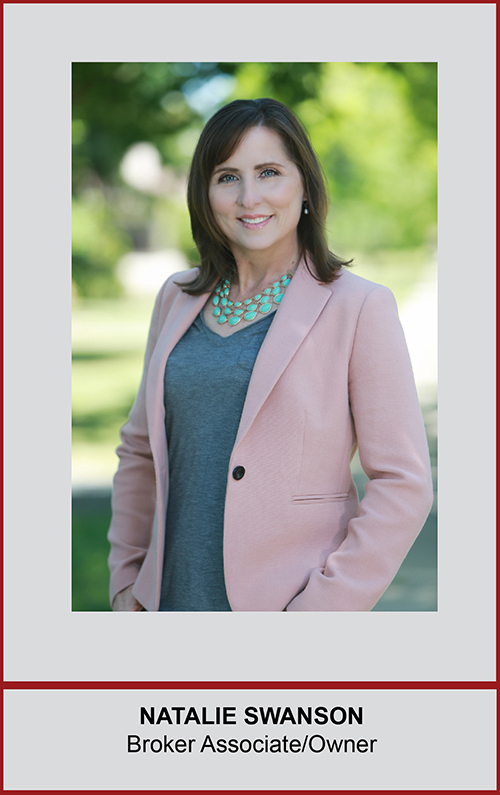 Natalie is an active member of the local real estate community and various Realtor associations, a certified distressed property expert, and a member of the Livermore Chamber of Commerce. Natalie has her Seniors Real Estate Specialist® (SRES) designation from the Seniors Real Estate Specialist Council of the National Association of Realtors®. The course helps in understanding the needs, considerations, and goals of real estate buyers and sellers aged 55 and older. She can help you make decisions whether you are buying, selling, relocating or refinancing. When Natalie is not busy assisting her clients, she loves spending time with her husband and two girls. Did we mention that she is married to her high school sweetheart who also grew up in the Livermore area? They enjoy traveling and spending time relaxing with family.